For years I’ve wanted to visit the Galapagos Islands. After photos of them in National Geographic set the hook in my childhood mind, I’ve been fascinated by them ever since. 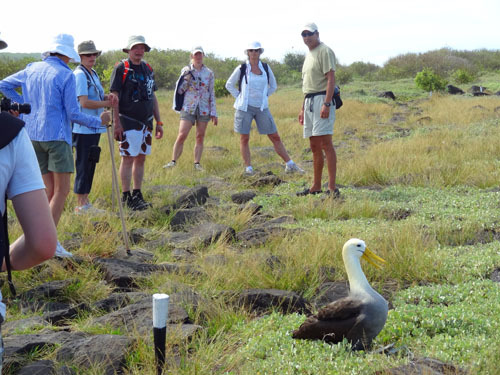 First made famous by Darwin on his historic voyage on HMS Beagle in 1835, the Galapagos is a place where you find species unlike any other in the world. Marine iguanas (the only sea lizards in the world) that look like little dragons, birds with blue or red feet, albatrosses with seven-foot wingspans, gigantic 100+-year-old tortoises weighing more than 500 pounds…it’s a mini-Jurassic Park of sorts, plopped in the Pacific 600 or so miles off the coast of Ecuador. Since we would be in Ecuador visiting Cuenca and Quito, I jumped on the opportunity to visit them and tagged it onto the end of our trip. We decided to see them on a yacht, one of the best ways to see the islands, and because of time constraints chose a three-night, four-day sail. It was relatively short trip but it gave us a good feel for the islands. After a 2½-hour flight from the mainland we arrived at the tiny airport on the island of San Cristóbal, which had a miniscule customs clearance and passport control. We had already cleared customs when we entered Ecuador but here they do it all over again to ensure that no seeds or plant materials are brought onto the islands, which could easily destroy the delicate environment. A few have already taken root, brought in by local farmers years ago. Once through Customs, which seemed to take forever, we were collected by an island naturalist who was attached to our yacht. 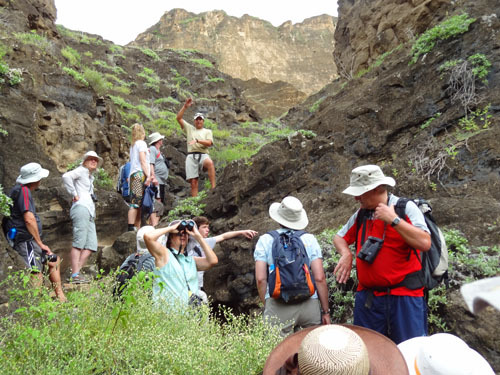 One of the rules in the Galapagos is that a park naturalist must accompany every group wherever they travel. Even if you arrive in your own boat he/she lives aboard with you while you’re in island waters. He herded us along with a dozen others onto a bus for the five-minute drive to the harbor. On the small pier we walked past some sea lions sleeping under benches before boarding Zodiac dinghies for the ride out to the ship. Already I was beginning to feel like Jacques Cousteau. Our yacht, La Pinta, was a comfortable and modern 207’ ship that carries 48 passengers and 24 crew and 3 naturalists, one for ever 16 passengers, as required by law. For the next several days it provided us everything we would want including good food, wine and wifi. 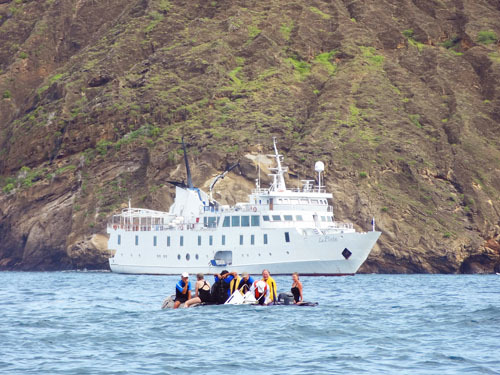 We spent the first two days in different areas around San Cristóbal, and then moved on to Española Island, with the ship repositioning itself during a meal or at night. Our days were planned with morning and afternoon excursions, with lunch back on the ship. 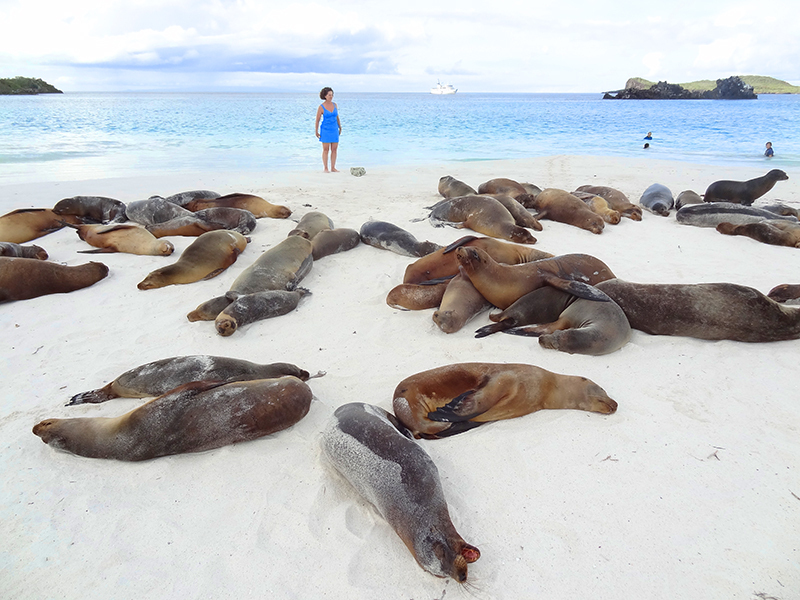 We were also given an hour or two on an island beach most days, usually sharing the sand with a herd of sea lions after a short hike. 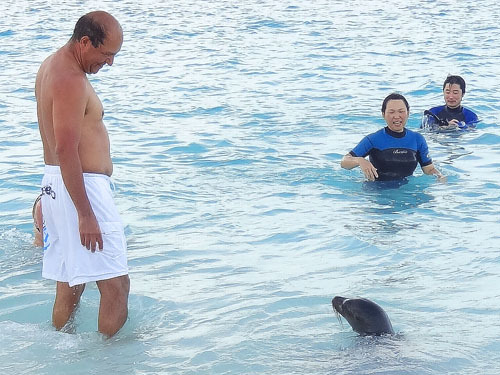 Everyone enjoyed the sea lions since the inquisitive juveniles would go into the water to play with you, or just surf and tumble on the small waves along the shoreline. All in all, we took three hikes during the cruise. The first was fairly easy across flat land into the bush, but the other two pushed the fitness envelope a bit. One involved an hour’s traipse up a gorge onto a plateau to see red-footed boobies and other birds. 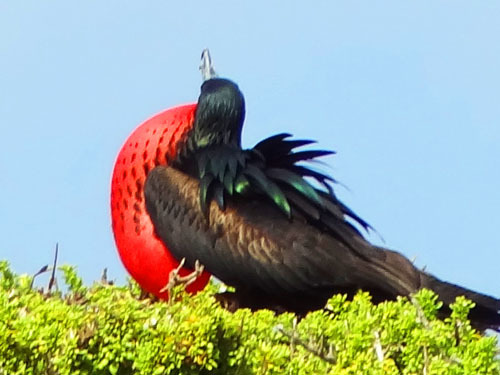 The other — to see the blue-footed boobies, the famous waved albatross and marine iguanas — was across extremely rocky terrain, where we had to use walking sticks. We spent another morning out on the water, some of us snorkeling in the open sea off a Zodiac, the others taking a ride in a glass-bottom boat. The four days was quite an experience for everyone. Being able to see species of birds and reptiles found nowhere else on earth is thrilling, but seeing them in their natural surroundings is something you’ll never forget. But the best thing about a visit to the Galapagos is that here you can get quite close to them since they have no fear of humans. On one of our hikes a bird landed on one woman’s head when we stopped to listen to the naturalist. Others would land on branches only a foot or two away from you. Wherever we went we could walk right up to birds and sea lions and other wildlife, as long as we didn’t touch or scare them. 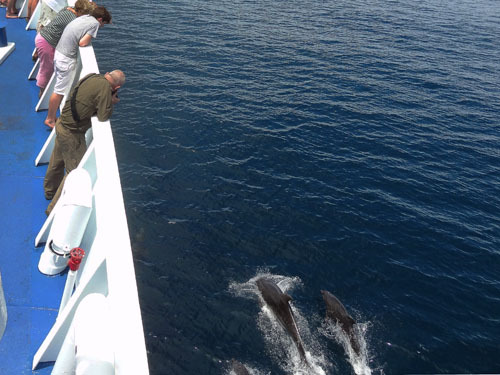 Our interaction with wildlife also continued onboard the ship. On two occasions the captain announced he had spotted dolphins, which turned out to be very large pods, much larger than I had ever seen before, perhaps numbering in the hundreds. After he steered the ship towards them they swam along with us, with some diving under the ship, going from side to side. We also came across a grey whale swimming lazily along. 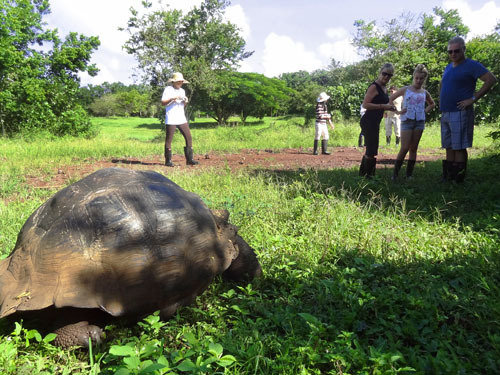 What was disappointing, however, was that although it was listed in the itinerary from our travel agent, we never visited the Charles Darwin Research Station where giant tortoises are being reared in captivity in an effort to save them from extinction. Still, though we did see one of the giants on the last day of the trip when we made a quick stop at a ranch en route to the airport. Startled when I walked up from behind, it made a loud hissing sound as it pulled its head into its huge shell. 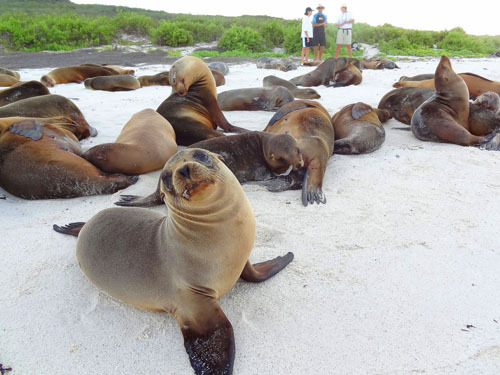 A trip to the Galapagos is a trip of a lifetime for many people, and it’s one of those places you need to put on your “must-travel-to” list (I hate the over-used “bucket list”). To its credit the Ecuadorian government has placed strict controls on what you can do on the islands and limits where any tour company can go on a specific day. This works well since you don’t have four ships dumping hundreds of people onto the same strip of beach, and you don’t come across other tour groups as you hike through the interior. 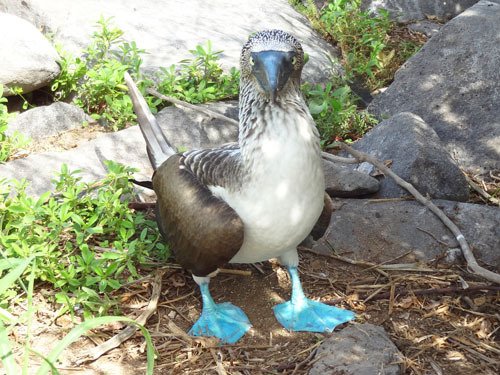 On the other hand, the Galapagos are not for the budget-minded. And there is a small potential for danger. More on both of those subjects next week. Melissa and I visited the Galapagos about 10 years ago. Thanks for resurrecting those past memories. A must trip for everyone. I guess you were wowed by it as much as we were! We leave next Saturday for Quito. 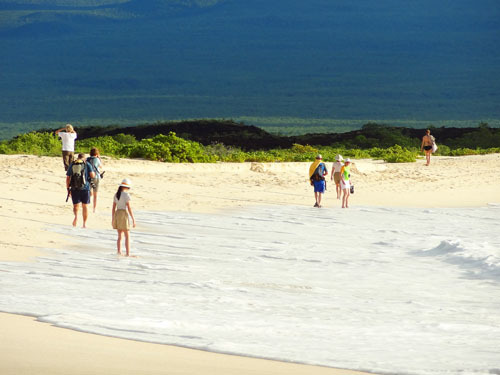 On Tuesday, we begin our 8 day 7 night adventure to the Galápagos Islands. Looking forward to the animals, birds and snorkelling. Have a great trip Lorne. I bet you’ll love it! 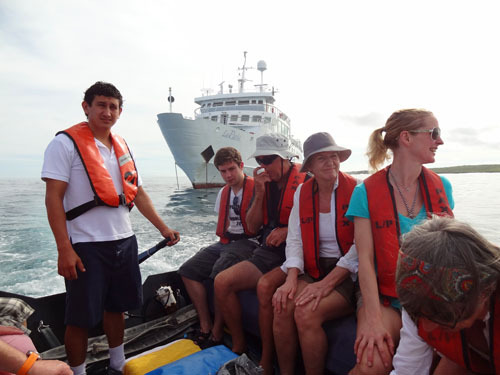 We are now in Lima after 8 day/7night cruise in the Galápagos. The naturalist was excellent and the crew were also outstanding. Some hikes are demanding for my 65 yo joints but most of the guests were much younger and coped wonderfully. The activities and excursions were exciting and memorable. Very enjoyable now off to Cusco. I bet the joint pain was worth it, wasn’t it? Have a great time in Peru!